Saturday, Dec. 4, 9 a.m. - 4 p.m. Featuring more than 100 vendors and breakfast with Santa from 8 a.m.-9 a.m. with an all-you-can-eat pancake breakfast ($5 adults/ $3 children). The event also includes entertainment, a quilt raffle, and a used book sale. The other side of town Violet will be here. 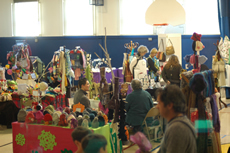 Know of any other fun bazaars? Post them in the comments! Older PostGreen Bag Challenge-A whole lotta LINKS!